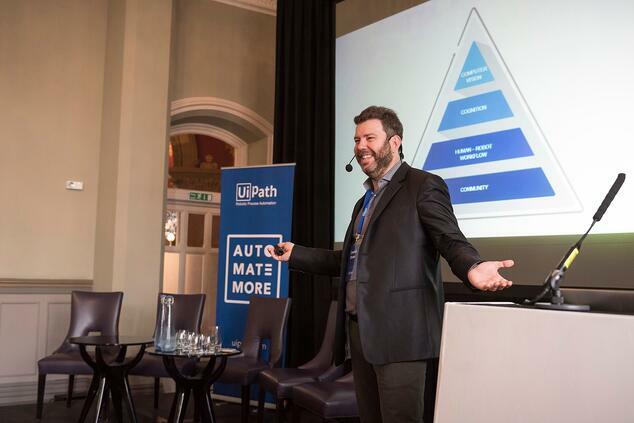 UiPath, the leading Robotic Process Automation (RPA) software company, is today announcing a Series A investment totaling $30 million led by Accel and with participation from previous investors Earlybird Venture Capital, Credo Ventures and Seedcamp. The funding will be used to accelerate the company’s rapid global expansion and product development, building on its six times growth in 2016. UiPath builds intelligent software robots that help businesses globally automate repetitive processes by leveraging cutting-edge computer vision technology. Large organizations across every industry spend a significant amount of time and resources performing such processes across HR, finance, accounting and operations (e.g. claims handling for insurance providers, employee onboarding, back office support etc). Digitizing these processes improves productivity, accuracy and compliance dramatically, allowing employees to focus on more creative and strategic work. UiPath will use this investment to boost hiring in order to keep up with rocketing demand for its products in North America, Western Europe, India, Japan and South East Asia. The funding will also support continued investment in product development and Artificial Intelligence capabilities, especially around its core computer vision technology. Additionally, the company will focus on cognitive capabilities enabling organizations to handle the vast amounts of structured and unstructured data required to deliver truly intelligent automation. UiPath has built strong momentum in a short period of time, growing to a team of 150 employees. It has over 150 partners including the major consultancies such as Deloitte and Capgemini, and 200 customers globally in industries ranging from banking, financial services and insurance through to manufacturing, utilities, healthcare and government. Many leading enterprises are among its customers, including blue chip companies such as Lufthansa, Generali, Telenor and Dong Energy. The company is well positioned to conquer the global RPA market, which is expected to reach $9B in size in the next seven years. UiPath has won top industry accolades for its technology, with the latest Forrester report on RPA identifying the company as a leader in the space, overtaking its competitors in technology performance. Everest Group also rated UiPath an ‘RPA Star Performer’ for 2016 with regards to its market impact. This investment comes on the back of increasing funding activity for artificial intelligence startups. 2016 saw a record of $5B venture capital funds flowing into AI companies worldwide, an increase of 60% compared to 2015. UiPath is a leading RPA vendor providing a complete software platform to help organizations efficiently automate business processes. UIPath is a US-based company founded in Romania, with additional offices in the UK, India, Singapore and Japan. The company has 200 global customers (75% of which register revenues exceeding 10 billion dollars) and over 150 partners across the globe. http://www.uipath.com - Twitter - LinkedIn. Accel is a leading early- and growth-stage venture capital firm, powering a global community of entrepreneurs. Accel backs entrepreneurs who have what it takes to build a world-class, category-defining business. Founded in 1983, Accel brings more than three decades of experience building and supporting hundreds of companies. Accel's vision for entrepreneurship and business enables it to identify and invest in the companies that will be responsible for the growth of next-generation industries. Accel has backed a number of iconic global platforms, which are powering new experiences for mobile consumers and the modern enterprise, including Atlassian, Avito, BlaBlaCar, Deliveroo, Dropbox, Etsy, Facebook, Flipkart, Funding Circle, Kayak, QlikTech, Simplivity, Slack, Spotify, Supercell, WorldRemit and others. Credo Ventures is a venture capital company focused on investments in Central and Eastern Europe. Their mission is to identify and back the most interesting early stage companies in the region, support them in their growth plans and help to achieve their objectives. Credo is looking for opportunities to invest in high-growth potential companies with international ambitions and competence to execute and deliver. Credo's industry focus is IT, Internet & health. Founded in 2009, Credo Ventures is based in Prague, Czech Republic. Further information is available at http://www.credoventures.com/ , LinkedIn , Twitter or Facebook. Seedcamp is Europe's first seed fund, identifying and investing early in world-class founders attacking large and global markets through disruptive technology. Seedcamp expedites a founder's mission and creates value through immediate access to smart capital, a lifelong community of support and a deep network built upon a decade's experience. Since launch in 2007, Seedcamp has backed 240 companies, 18 of which have been acquired, has one unicorn and has supported companies who've gone on to raise over $500M in follow-on funding.